Born November 13, 1898, at Wright, Ford County, Kansas. Died June 11, 1964, at Eads, Kiowa County, Colorado. 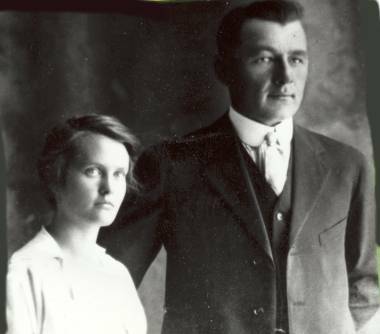 Married December 22, 1917, at Eads, Kiowa County, Colorado. Eugene E. Osolin, b. October 3, 1918, at Eads, Kiowa County, Colorado, d. March 14, 1919, at Eads, Kiowa County, Colorado. Aletha Fern Osolin, b. February 19, 1920, at Peabody, Marion County, Kansas, d. December 14, 2003. Merle Maxine Osolin, b. August 13, 1922, at Eads, Kiowa County, Colorado, d. November 27, 2003. Betty Lee Osolin, b. November 16, 1924, at Eads, Kiowa County, Colorado; d. January 13, 2008. John Dean Osolin, b. March 11, 1930, at Eads, Kiowa County, Colorado.